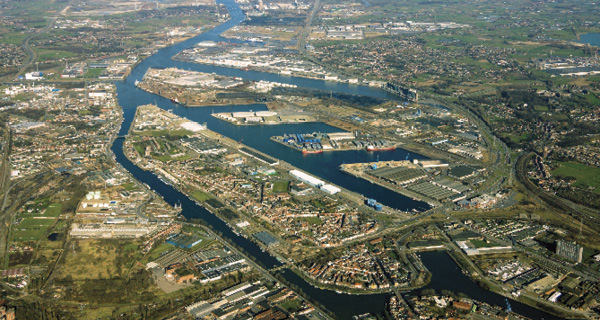 Starting in 2015, ships and companies will have to use only one port information system to report arrivals and departures at the Port of Ghent (pictured) and Zeeland Seaports. Dutch and Belgian port authorities implemented a single cross-border port information system for vessels entering the Zeeland Seaports in Vlissingen and Terneuzen (Netherlands)—which are situated where the Ghent-Terneuzen Canal meets the North Sea— and the Port of Ghent (Belgium), located 36 miles farther inland. Ships that sail into or depart from the Port of Ghent, or the ports in Vlissingen and Terneuzen, must report arrival and departure information electronically, which, in turn, guarantees the smooth management of ships through the canal. Both Ghent and Zeeland port authorities currently use their own systems, requiring ships arriving in both ports to submit all their data twice. Beginning in 2015, ships will have to use only one port information system to moor and unmoor at all three ports, benefiting not only waterborne traffic, but also all the companies operating in the cross-border canal area.